Huriti single includes the 2017 Global Music Awards winner in the Dance/Electronic music category Huriti (Mike Forst Remix) feat. Rachid Taha. Mastered by Ken Lee Mastering. Cover Art work by Juan Dedios Reyes. “Pa’lante” defines World Fusion pop music at its best! A unique blend of Middle Eastern, Funk, Latin and a touch of electronica makes this song a must hear! It features Cris Matos a Puerto Rican/ San Francisco Caballo Singer, monster Songwriter who is part of Manicato, his son Israel Matos’ San Francisco based band. They play unique music and sing original lyrics often labeled as Latin Reggae, Latin Rock, Rock, Plena, Bomba, Timba , but all extremely in the dancing genre. The message of the song: Moving forward with Love, Joy and Celebration! 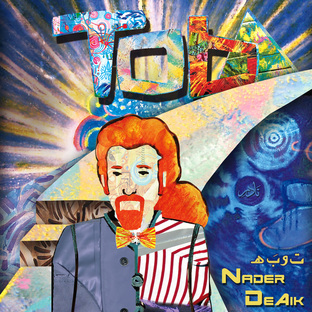 Album Sahran is Nader DeAik’s first 9 original track album. It Includes an exquisite blend of world music genres forming into a Middle Eastern pop album to remember! Album Sahran includes ART top 10 hit song “Rajae” along with it’s music video that was broadcasted world wide. It includes the energetic popular hybrid song “Orqus, Baila” along with it’s fresh up beat music video that was shot in Barcelona, Spain. world cup soccer Single "strike!" The Examiner wrote an article on DeAik’s world cup song “Strike!”. For full article please click here. San Francisco Bay Guardian featured another article for “STRIKE!”. For full article please click here.